实验一: Copy files into and out of the Hadoop Distributed File System (HDFS). SDSC - San Diego Supercomputer Center. To summarize, a new torrent of Big Data combined with computing capability anytime, anywhere has been at the core of the launch of the big data era. How People-Generated Data being used? Hadoop - Hadoop us designed to support the processing of large data sets in a distribute computing environment. Storm/Spark - handle real time data generated at a fast rate. 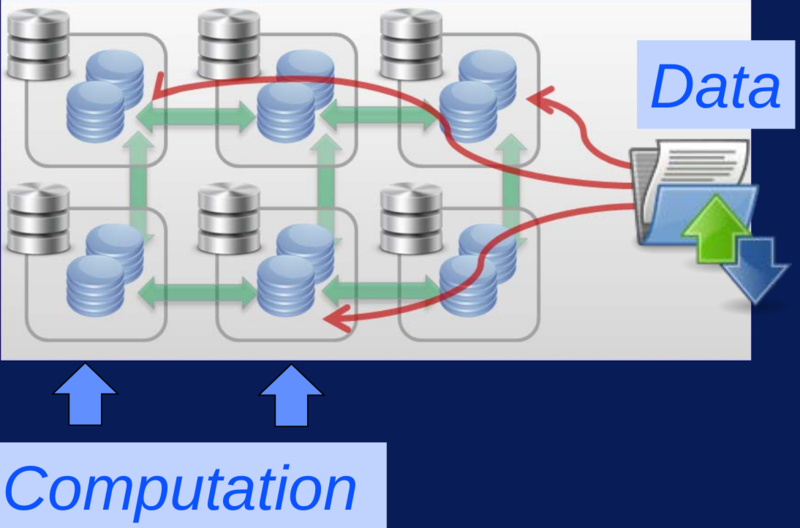 Data Warehouse - Extract, Transform, Load. Organization-Generated Data: Structured But Often Siloed, Benefits come from combining with other data types. The Key: Integrating Diverse Data - integrating diverse data streams you add value to your big data and improve your business even before you start analyzing it. 1. Volume(容量) - Volume refers to the vast amounts of data that is generated every second, minutes, hour, and day in our digitzed world. 2. Variety(多样化) - Variety refers to the ever increasing different forms that data can come in such as text, images, voice, and geospatial data. Variety == Complexity. The heterogeneity of data can be characterized along several dimensions. 3.Velocity(速率) - Velocity refers to the speed at which data is being generated and the pace at which data moves from one point to the next. 4. Veracity(真实性) - Veracity refers to the biases, noise, and abnormality in data. Or, better yet, It refers to the often unmeasurable uncertainties and truthfulness and trustworthiness of data. *5.Valence（连通性) - Valence refers to the connectedness of big data in the form of graphs, just like atoms. Scalability to large data sets - Partitioning or Splitting large files across multiple computers. This allows parallel access to very large files since the computations run in parallel on each node where the data is stored. 64 MB - The default chunk size, the size of each piece of a file is 64 megabytes. But you can configure this to any size. Simple Programming for big results. MapReduce is a programming model for the Hadoop ecosystem. It relies on YARN to schedule and execute parallel processing over the distributed file blocks in HDFS. MapReduce hides complexities of parallel programming and greatly simplifies building parallel applications. Hive has a SQL-like interface that adds capabilities that help with relational data modeling. Pig is a high level data flow language that adds capabilities that help with process map modeling. 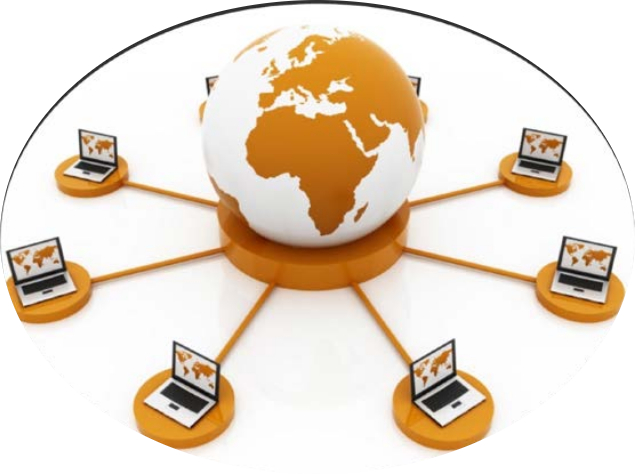 Cloud Computing - On-demand computing. The main idea behind cloud computing is to transform computing infrastructure into a commodity, this is what Big Data try to achieve in data processing/persisting. Go to https://www.virtualbox.org/wiki/Downloads to download and install VirtualBox for your computer. A alternative way, download virtualbox.repo, yum install via execute yum install VirtualBox-5.0. 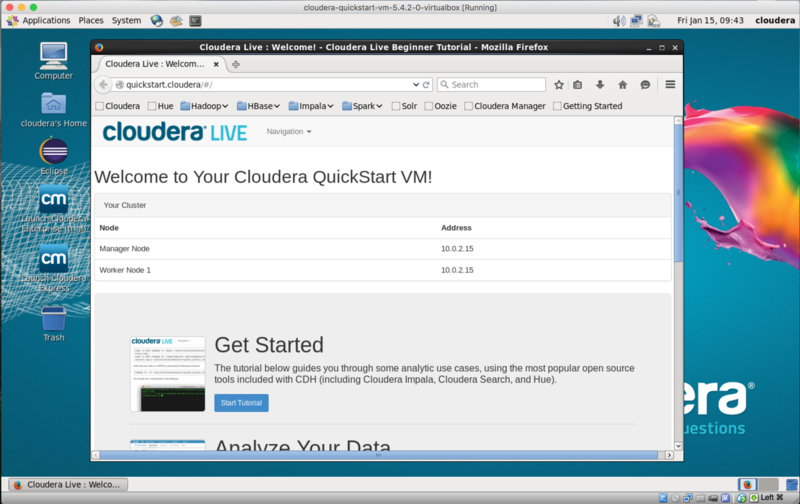 Download the VirtualBox VM from https://downloads.cloudera.com/demo_vm/virtualbox/cloudera-quickstart-vm-5.4.2-0-virtualbox.zip. Interact with Hadoop using the command-line application. Copy files into and out of the Hadoop Distributed File System (HDFS). 16/06/03 21:43:00 INFO fs.TrashPolicyDefault: Namenode trash configuration: Deletion interval = 0 minutes, Emptier interval = 0 minutes. Copy the results from WordCount out of HDFS. NOTE: wordcount posit at the end of output, wordcount: A map/reduce program that counts the words in the input files. NOTE: How many times does the word Cheshire occur? (Do not include the word ‘Cheshire with an apostrophe.) The answer is 6. Hadoop Common - contains libraries and utilities needed by other Hadoop modules. Hadoop Distributed File System(HDFS) - is a distributed file system that stores data on a commodity machine. Providing very high aggregate bandwidth across the entire cluster. 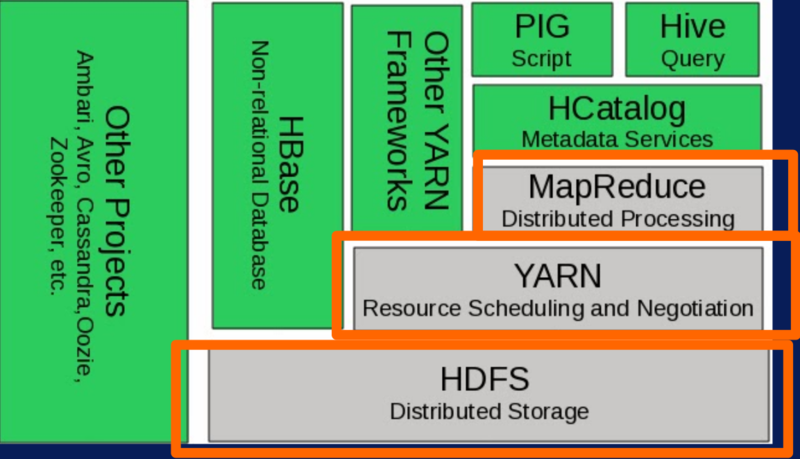 Hadoop YARN - is a resource management platform responsible for managing compute resources in the cluster and using them in order to schedule users and applications. Hadoop MapReduce is a programming model that scales data across a lot of different processes. HBase - Column-oriented database management system, Key-value store, Based on Google Big Table, Can hold extremely large data, Dynamic data model, Not a Relational DBMS. hbase.apache.org. Pig - PIG Highlevel programming on top of Hadoop MapReduce, The language: Pig Latin, Data analysis problems as data flows, Originally developed at Yahoo 2006. Hive - Data warehouse software facilitates querying and managing large datasets residing in distributed storage. 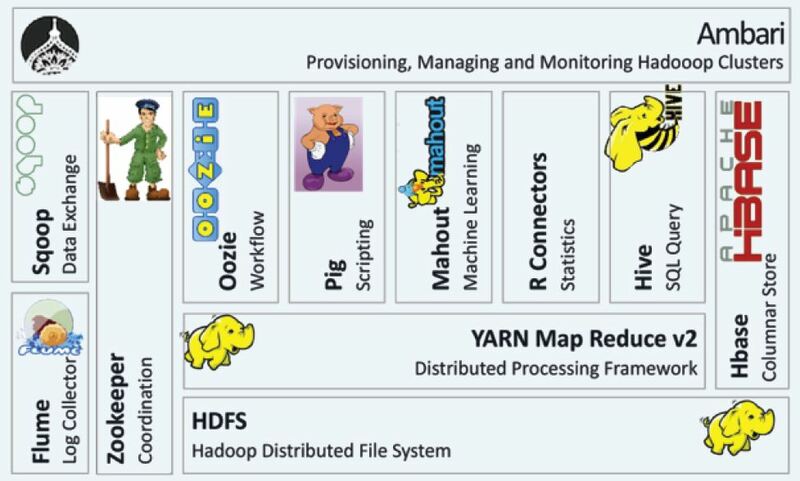 Oozie - A workflow scheduler system to manage Apache Hadoop jobs. Apache Sqoop is a tool that uses MapReduce to transfer data between Hadoop clusters and relational databases very efficiently. It works by spawning tasks on multiple data nodes to download various portions of the data in parallel. When you’re finished, each piece of data is replicated to ensure reliability, and spread out across the cluster to ensure you can process it in parallel on your cluster. Flume is a scalable real-time framework that allows you to route, filter and aggregate in to all kinds of mini-operations on the data as you transfer it on its way to scalable processing platform like a Hadoop.